Which One Is Better? Dentures or Dental Implants in Lynnfield? Did you know that 178 million Americans are missing at least one tooth? There are many different reasons for tooth loss, including genetics, gum disease, injury, poor oral hygiene and a lack of dental care. Regardless of the reason behind tooth loss, one thing remains the same: Everyone wants the best option for replacing their teeth! Of course, that depends on your individual needs, so how do you decide between dentures and dental implants in Lynnfield? The information can be overwhelming, but don’t worry – we’ll break down the pros and cons and tell you how to find out which option would work best for you. Keep reading to learn more! Dentures in Lynnfield are a great option for patients who need a lower initial cost. For patients who have recently lost their teeth, dentures offer a replacement solution while healing. Dentures work particularly well for the upper arch. Dentures can result in bone loss over time. They may become loose and start to shift. Dentures need periodic adjustments to fit properly. They don’t look as natural as implants. Some foods are difficult or impossible to eat with dentures, such as corn on the cob or apples. Dentures need to be replaced periodically, which increases the cost over time. Implants can last decades or even a lifetime with basic care and maintenance. Offers the strongest, most natural result. Implants will look and feel more like your own teeth than any other option. Implants are easy to maintain. They require the same basic care that your natural teeth do (i.e., brushing, flossing and regular dental care). The bone mass in your jaws is maintained, so the shape and structure of your face won’t change over time. Requires a minor surgery to place the implants. Also requires 3-6 months of healing time while the implant integrates, or fuses, with the surrounding jawbone. May not be an option if you’ve lost a lot of bone mass in your jaws. The best way to find out which of these choices will better suit your needs is to schedule a consultation with a dentist in Lynnfield who has training in prosthodontics, a specialty field of dentistry that focuses on replacing missing teeth. Several factors will be taken into account, including your medical history, age, finances, lifestyle choices (e.g., smoking), and hygiene habits. In addition, images will be taken to assess your bone levels. Regardless of your situation, there’s a solution that will work for you. Rest assured that your smile and self-confidence can be restored! Dr. Rob Schumacher is a dentist in Lynnfield who has pursued advanced training in several specialty areas, including prosthodontics. He always takes each patient’s unique circumstances into consideration before recommending a treatment plan so he can provide the best result possible. If you have any questions, he can be contacted through his website or at (781) 334-3400. Comments Off on Which One Is Better? 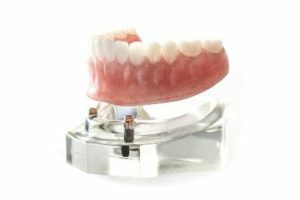 Dentures or Dental Implants in Lynnfield?